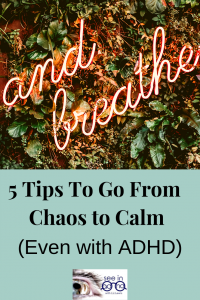 Episode 301 of the See in ADHD podcast gives you 5 simple (but not easy) tips to go from chaos to calm even with ADHD. For more info on increasing self-awareness, see this post. See this post on Emotional Management. Identifying the difference between things you can control, and things you cannot. Becoming conscious of your thought and behavioral patterns. Taking action instead of complaining. Looking forward, not backward, in your life.